The Future is Asia reads the Asian Football Confederation (AFC) motto. A bold declaration, and at first glance you’d be hard pressed to argue with it. The confederation presides over the largest, most populous continent in the World, not to mention Australia, geographically a separate and entire continent but now intrinsically Asian in football terms. This juggernaut with so called sleeping giants such as India and China, untapped as of yet, has the potential to dominate the global game, if it so chose. It would inexorably take over and lead the way, the rest of the world would watch on in envy and try to mimic the best Asian teams, FIFA would relocate head office to Singapore, the Asian Champions League final – the most watched single sporting event in the World – would be the pinnacle of club football. This, of course, is all a mere fantasy, one that hasn’t seemed as far away as it does now in the aftermath of an abysmal world cup for Asia. Four nations entered the race for the World Cup on the first day of the competition, and all four had unceremoniously been dumped out of the tournament by the end of the group stage. A humbling sound, you can already here the baying mob outside of FIFA head office demanding Asia be stripped of its valuable 0.5 spot for the next World Cup, and who could argue against them with any real conviction after what we have seen in Brazil? Australia, with Ange Postecoglou at the helm were expected to be battered silly in a tough group that included Holland, Spain & Chile. But they proved their critics wrong, with heartening displays against Chile & Holland, Cahill provided one of the best goals of the World Cup (and no doubt an all time great goal) in the process with a sublime volley which crashed in off the underside of the bar. Their final dead rubber game loss to Spain was the low point, but the Australians while racking up three losses, can go home possibly the happiest with how they have performed for the Asian teams. Iran meanwhile came into the tournament with disorganised preparations, and little hope of making the second round. But Queiroz had them well drilled and they proved that they could compete with pride, as they went into their final group game with a chance of qualifying to the last 16. But it wasn’t to be. Queiroz’ future remains in the balance, amid reports he has left Tehran without signing a new contract, mere months before the Asian Cup. Japan ended the World Cup after an abysmal showing, they had gone to the World Cup with huge expectations, but after some impressive friendly displays they failed to click and instead disappointed hugely. 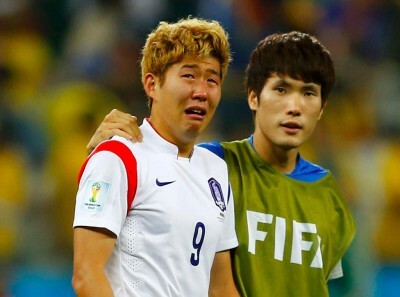 South Korea with their young squad had less expectations but they also crumbled on the big stage, and while less soul searching needs to take place in their camp, they also will be raring to go again in the Asian Cup. From the ashes of the World Cup, the local leagues are kicking off in West Asia once more, and we have resumed service in the Asian Champions League & AFC Cup. The FAs of the Asian Nations who have qualified for the Asian Cup 2015 are setting up their friendly games in preparation for the four yearly tournament. Before that the 2014 Asian Games in Incheon will host its own football tournament in September. But a certain malaise still affects the continent, one that I’m sure will come to pass in the coming months. The gigantic continent took a hammering in Brazil, but it is beginning to stir once again.